On January 22, Cellulant, a digial payments company, held a memorial service for six of its employees who were victims of the Riverside Complex terror attack that claimed the lives of 21 people. Thai citizens will on Wednesday host a memorial service honouring 21 people killed in last week's terror attack on the Dusit Hotel complex, a firm owned by a multinational from the Southeast Asia country. 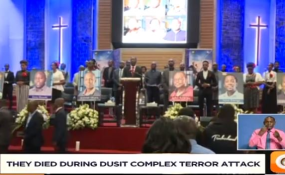 The memorial service in Bangkok, Thailand's capital city, will start at 1pm (9am in Nairobi) and will be attaended by Kenyans living in the southeast Asian country. Thailand's Prime Minister Prayut Chan-o-cha sent President Uhuru Kenyatta condolence message last week. "On behalf of the Government and the people of Thailand, I wish to extend my deepest sympathy and condolences to Your Excellency, and through you, to the bereaved families of those who were affected by this terrorist act," he said. The DusitD2 Hotel in Nairobi, the scene of the terror attack last Tuesday, is one of the 29 hotels and resorts owned by the Dusit Thani Group of companies, also known as Dusit International. The firm is a Thai multinational hospitality company. Headquartered in Bangkok, Thailand, Dusit International was founded in 1948.